Showcased a day ahead of the 2018 EICMA show, the latest-gen YZF-R3 features a R1-esque design and LED headlights! 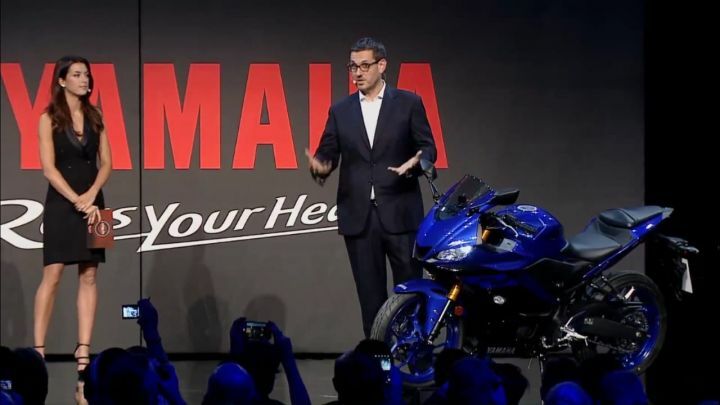 After unveiling the latest generation of the YZF-R3 last month, Yamaha has now showcased the 300cc sportsbike at the brand’s Press Premiere held a day before the start of the 2018 EICMA show in Milan, Italy. Lately, Yamaha’s flagship R1’s design has been tricking down to the company’s smaller capacity sportsbikes, and the new R3 is no different. It looks a lot more compact than the previous-gen model thanks to the relatively smaller and slimmer LED headlights and smooth lines on the fairing. As a result of the new front fairing and the windshield, the top-speed has gone up by 8kmph. It also gets a fully-digital instrument cluster and a redesigned fuel tank that’s similar to that of the YZF-R15 V3. However, the volume remains the same, at 14 litres. In a bid to make the ergonomics sportier, the handlebars are now 22mm lower. The new fuel tank design is also 31.4mm wider above the knee area and 20mm lower around the fuel cap compared to the older one. The high-set tail section, on the other hand, has been carried over from the older bike. With all these aesthetic updates, the wheelbase and the overall dimensions (length, width, height, ground clearance and wheelbase) have remained unchanged compared to the old-gen motorcycle. However, the weight has gone down from 173kg to 169kg, kerb. Sadly, the powerplant does not get the Variable Valve Actuation (VVT) technology a la the R15 V3. The engine is the same 321cc parallel-twin unit that churns out 42PS of power at 10,750rpm and 29.6Nm of peak torque at 9000rpm. It works in tandem with a 6-speed transmission sans slipper clutch. The new motorcycle features a 37mm Kayaba upside down front forks with gold finish in place of the telescopic units in the earlier model. At the rear, the bike continues with the link-type KYB monoshock. The brakes haven’t been changed either - you continue to get the same 298mm front and 220mm rear disc with dual-channel ABS. The new Yamaha YZF-R3 goes up against the Kawasaki Ninja 300, KTM RC 390, Benelli 302R and the TVS Apache RR 310. We expect this updated motorcycle to enter our shores by mid-2019. However, to keep the cost competitive, it could come with traditional telescopic forks instead of the inverted ones, just like what the company did with the R15 V3. Yamaha also showcased the R3 GYTR (Genuine Yamaha Technology Racing) cup-spec motorcycle, complete with Ohlins suspension, Brembo front disc, Akrapovich exhaust and GYTR engine kit. Share your experiences with YZF R3? Confused about Yamaha YZF R3?